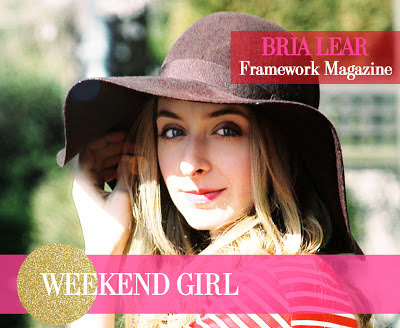 We're very excited to announce that our December Weekend Girl is the fabulous Bria Lear, Editor of Framework Magazine. For those of you who are familiar with Framework Magazine then you'll know EXACTLY why we chose Bria. For those of you who aren't familiar with Framework, it's an incredible online magazine featuring talented women, fashion, lifestyle, and so much more (prepare to be obsessed). Bria is one of the most skilled writers we know and has an eye for style and design like no other. We thought it was about time someone featured Ms. Lear as she has so much class, great style advice, and is the epitome of a Blubird Weekend Girl! our hot pink neoprene Tibi dress. See below!